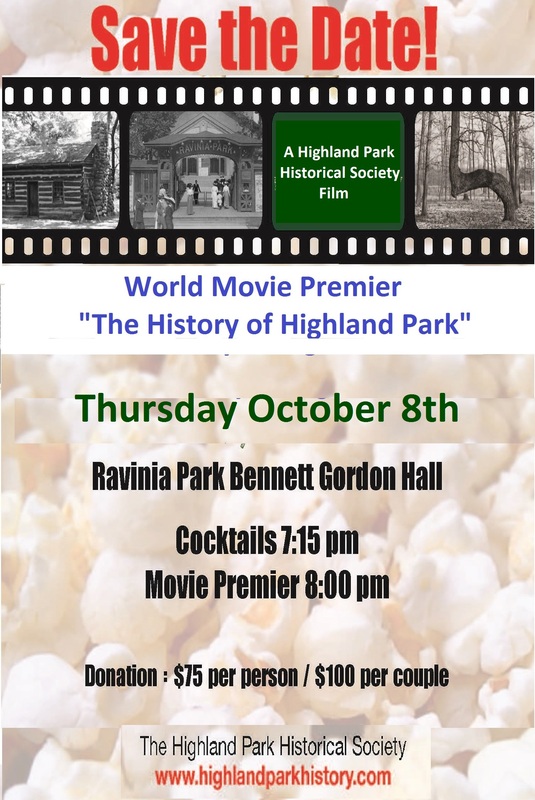 The HighlandPark Historical Society will host the premier of a new film The History of Highland Park on October 8th at Ravinia’s Bennett Gordon Hall. Tickets for the event are $75 per person or $100 per couple. Students, when accompanied by an adult, are free. The premiere is sponsored by Northern Trust, Lexus of Highland Park and Sunset Foods. A wine, cheese and dessert reception will begin at 7:15 PM and the screening will start at 8PM. The movie trailer is available here . Under the direction of JoBe Cerny, the movie uses archival photographs to show the change in less than 80 years as Highland Park morphed from Native American trails to trains, automobiles, electricity, the telephone and opera at Ravinia Park. It was created with the financial support of YEA Highland Park and with the help of our community sponsors, the City of Highland Park, the Park District, the Library,School Districts 112 and 113 and the Cultural Arts Commission. This original documentary traces the history of Highland Park from its inception as a rail road town and summer resort. As a planned community, The Highland Park Building Company, hired a nationally renowned landscape firm to lay out the town. Architects at Cleveland and French were struck by the natural beauty of the forests, ravines and lake shore prompting them to create a plan that would preserve these natural amenities. Over the years,Highland Park residents continue to appreciate and protect these amenities. Proceeds from the screening will support the Stupey cabin restoration project as well as the long-term mission of the Highland Park Historical Society. The 1847 the Stupey Cabin was built by the family of Prussian immigrant Frances Stupey. It is the oldest standing structure inHighland Park. The cabin is owned and maintained by the Historical Society. It was moved to its current site in 1968. The cabin is in need of significant preservation work which includes removing and replacing flooring, foundation work, and chimney tuck-pointing. The year-long renovation project started this summer and is expected to be completed by July 2016.